A lot of horse owners also have dogs. Regular and sufficient exercise of both animals is very time consuming. Therefore it makes sense to combine it. But not only the time factor is a good reason to let the dog accompany you when you go for a ride. The different paces are not only attractive for the rider. During the walking phases the dog has time to experience the world with its nose, and trot and canter are a nice change to the usual speed during dog walks. Dogs just love it. In order to enjoy a smooth ride, it has to be considered that the dog is a predator and the horse a flight animal. Furthermore the higher distance between rider and dog can be challenging. A reasonably well-behaved dog is the basis before the next steps (e. g. socialization with the horse, leash the dog from horseback, road safety, etc.) will be tackled. This training also starts with a detailed conversation to understand the personalities of the team. 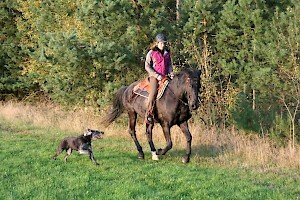 Based on the behavior of horse and dog and state of knowledge of the owner the further training process will be defined.